The first three volumes suggested that Luvah would be a journal with issues, so year 1, issue 3, etc., but then online. 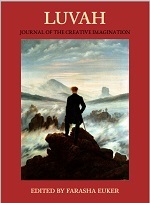 The previous issues where published somewhat as a journal, for example in one PDF with a cover and all. Luvah Journal volume 4 is ‘just’ a page on the website with links to the articles in PDF and html (no longer Epub unfortunately). A bit like I also said about issue 1/3, Luvah does not seem very much Traditionalistic. There is academia, philosophy and poetry. Nonethess there are, like in the previous issues, interesting articles. The article about William Blake was less interesting than it seemed initially, but the article about feminism and “queer theories” in Judaism is something you do not hear a whole lot about. Keith Doubt wonders if ‘reading e’ is the same as reading a book. His article is too psychological for me and he seems to largely miss a big development in digital reading, but he does raise a few interesting questions. For the rest you can read poetry, prose, a book review and another few texts. Click on the cover to go to the Luvah website.